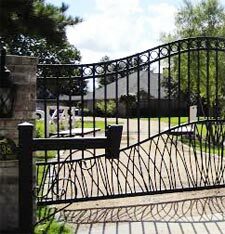 Art Fences is the leading Gate Opener provider for over 22 years in Houston. Art Fences offers a wide variety of automatic gate openers at affordable prices. We feature swing or slide gate operators perfect for residential, commercial, or farm use. An electric Gate Opener is the mechanized arm that helps automatic gate open and close. A signal is sent from an access control, similar to remote control or keypad that tells the motor to open or close the gate. This will automatically reverse in direction if it hits an obstacle and can stay open if instructed. Unsure about what gate opener is right for you? Please email us or call 281-932-0835 for help from our gate professionals who are experts in the field. No pushy sales talk, just helpful solutions to your questions. Having an electric entry gate opener installed is the excellent addition to your entry gate and provides indispensable convenience. This allows a gate to be opened and closed with the simple press of a button, and without ever having to leave your car.